With any stain speed is of the essence and it’s important to tackle any spillage as quickly as you can. The longer you leave a stain the worse it gets as it seeps into the fibres of your carpet. Most of us when we notice any sort of stain have the tendency to grab a paper towel and start rubbing it like fury. This technique spells disaster and causes the stain or nail polish in this example, to soak further into your carpet. Instead it’s important that you take a clean white cloth and start to gently blot at the edges gradually working your ways inwards so that the stain doesn’t spread. Before reaching for your cleaning products use the same blotting method to remove as much of the excess fluid as you can. Before you use any cleaning products on your carpet it’s always wise to test them out first on a patch of carpet which is hidden out of view. 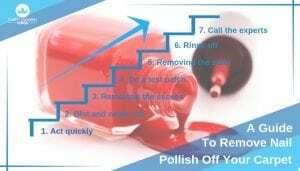 This is particularly important if you have a dark coloured carpet as some products will remove the nail polish but lighten your carpet at the same time. If your carpet happens to be light in colour then you may be able to remove the stain using nail polish remover. Check first that it is the non-acetone variety or you could do more harm than good. Pour a little of this onto a cloth and use a blotting method on the stain once more, slowly lifting your cloth as the stain comes out. If your carpet is dark, then you could try blotting with alcohol or hair spray. Again, spray or pour onto a cloth and not directly onto the carpet. If neither of these methods work then you could dry a carpet cleaning fluid. Once the stain has come out you need to rinse the area with cold water and dab it with a cloth to dry. If there’s a strong smell of nail polish or remover, then try washing the area with a mixture of diluted dishwasher detergent and tepid water before rinsing. If you’ve done your very best but the stain is still visible then your best course of action is to call in a professional carpet cleaning company such as ourselves. We’ve got both the expertise and the products to get rid of stains and leave your carpet odour-free and looking as good as new once more. Don’t delay call Carpet Cleaning Kings on 1300 7000 75 today. When Is The Best Time Of Year To Get My Carpets Cleaned?